Figueroa is in Mexico City after traveling up from the Mexico-Guatemala border with the caravan that is slowly making its way, mostly by foot, up through southern Mexico, even as a new group of refugees strives to catch up with it. By sending troops to the border and threatening to abolish birthright citizenship, Donald Trump has been generating headlines in his attempt to make political hay out of these desperate refugees. Few people know the root causes of migration and the perils along the migrant trail like Figueroa. A leader of the Mesoamerican Migrant Movement born and raised in southern Mexico, his job is to find missing migrants and unite families that have been split by forced displacement. He travels back and forth between villages in Honduras and Guatemala, where he contacts mothers attempting to locate loved ones, and Mexico, where their sons and daughters crossed over and were lost. Although hundreds of people leave Honduras every day to go north, the number in this particular exodus is unprecedented. The UN Refugee Agency (UNHCR) said that Mexican officials registered 7,233 people crossing the Rodolfo Robles border bridge from Guatemala on October 19 and 20, which they reached after leaving San Pedro Sula, Honduras, on October 12. By far the majority are Hondurans. San Pedro Sula, an industrial city with few jobs and plenty of violent crime, was recently the murder capital of the world for two years running. With high unemployment, gangs, corruption, and ineffective law enforcement, the city spits out citizens on a daily basis, especially the young. Many other parts of Honduras are nearly as bad. Since the 2009 coup d’état, the country has been ruled by conservative governments and an elite determined to squeeze personal gain out of the nation’s resources. After the United States helped block a return to constitutional rule, the new leaders declared Honduras “Open for Business.” Today the country has the most extreme pro-corporate legislation in the region. The priest and grassroots leader Ismael Morales writes in ALAI (the Latin American News Service), “The caravan is the explosion of a pressure cooker, which the Honduran government, in association with a handful of business and transnational elites, has been heating up for at least a decade.” He cites “a development model based on extractive industries and privatization and concession of public goods and services” as the key factor. While migrants usually refer to gang violence as the reason for their decision to leave, state violence plays a big role, especially in Honduras. Looting that can’t be accomplished through changes in law and legislation is done at the point of a gun. 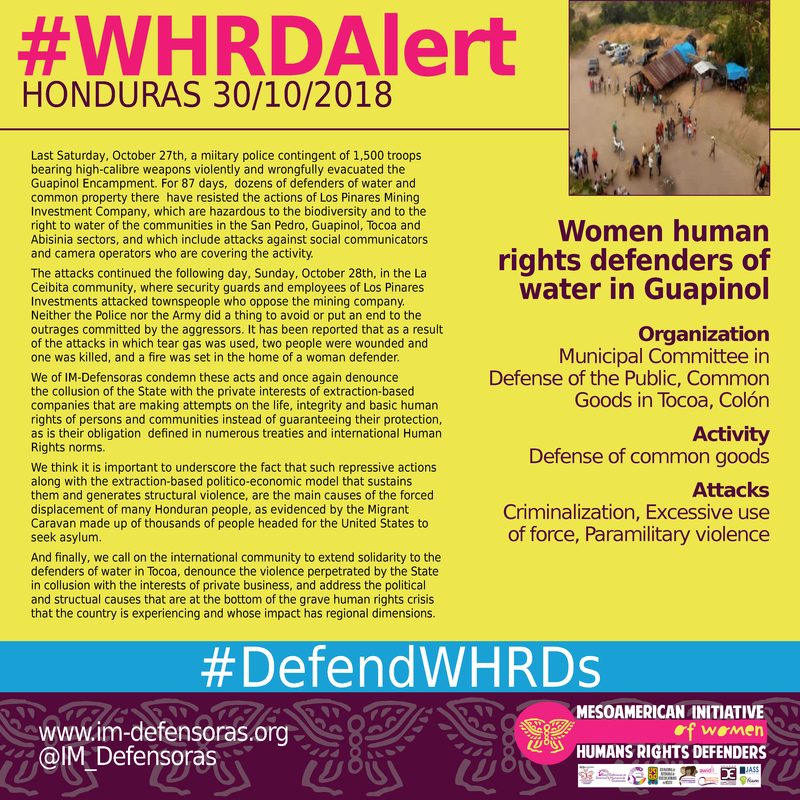 The assassination of Berta Cáceres in March of 2016 and attacks like the recent armed eviction of water defenders in Tocoa generate constant fear. Last November, President Juan Orlando Hernández ran for reelection, which is prohibited under Honduran law. He lost, but then stole the election, again with US support. The political crisis and crackdown on protesters have further eroded rule of law. Two days after the caravan started in San Pedro Sula, Juan, 33, joined it, along with his wife and children, 2 and 10. He’s a day laborer, but it’s been a long time since he’s had a job. He says that in his neighborhood, criminals kidnap children to force them to join gangs, while the authorities look the other way. His family is now deciding whether to stay in Mexico or move on. The caravan has snowballed since it left Honduras, and now a second caravan is entering Mexico. *Laura Carlsen is a political analyst and director of the Americas Program of the Center for International Policy. She is based in Mexico City.